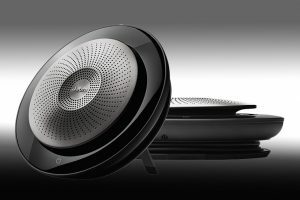 Pair two Jabra Speak 710s wirelessly,Looking for true, stereo sound or hosting a bigger meeting? You can pair two Jabra Speak 710s in seconds and easily cover a meeting room of 12 people or enjoy even more powerful stereo music. Our products work out of the box* and allow you to combine perfect sound quality with great comfort.